The smartphone market is crowded (or, 'healthy', you could say); we have iOS and Android in the top spots, and a range of competitors like Windows Phone 7, Symbian, BlackBerry 7, webOS, Bada, etc. iOS, Android, WP7 are on the ascendency, most other things are static or in decline. What you often find though, is that you can tell the good ones apart by how consistent and pleasant to use they are. Pick up a webOS device, for example, and you instantly see a pretty OS with many great UI concepts. Use it for a little longer, and you start to see how shallow that veneer actually is - user experience nightmares, terrible performance, half-finished designs, etc. The sliding three-pane UI in webOS 3.x is a great example of this; drag the divider and the panes will judder across the screen, the main pane not resizing anything until you let go, at which point it snaps to the new position with no animation or feeling. Compare with the Twitter for iPad UI and how fluid it feels, and you would be appalled. It's such a pity, because webOS is a great concept and implementation - it just doesn't have the final 10% to make it feel like you're using something more than a pretty-looking webpage. I believe it's here to stay, however, unlike Symbian, BlackBerry OS, etc. iOS is the king, so far, with consistency of user experience. You'd have to make a conscious choice as a developer to create an app that breaks the inherent UX niceties and animation in the OS. I like to call this the 'soul' of the platform. Android, on the flipside, is a hodgepodge of inconsistent UX, where even Google's own apps decide to feature new styles and concepts in between OS releases (the App Marketplace, for example, has been redesigned twice in recent history, with neither style matching the rest of the OS). Windows Phone 7 also has a quality UX, until you reach the third party apps, where everything degenerates (the third-party apps, being Silverlight, have no relation to the native software that comes on the phone, which is all C++ and using the same frameworks). Recently, Nokia announced the N9, the first (and perhaps last) of their MeeGo smartphones. Where does MeeGo fit? 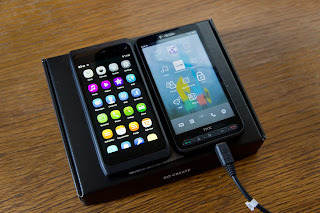 Long awaited, the expectations were really high for this device - MeeGo was originally supposed to be the savior of Nokia, their modern smartphone OS to replace the aging Symbian. When Nokia announced in February that they were instead going to move to Windows Phone 7 as their primary platform, most took it as a sign that MeeGo was simply never going to be ready, or competitive. The open-source version of MeeGo for handsets is so barebones that it would take another year at the least to build a compelling user experience on top of it, so it was understandable that Nokia would focus their efforts on WP7 instead. Then we saw the N9. 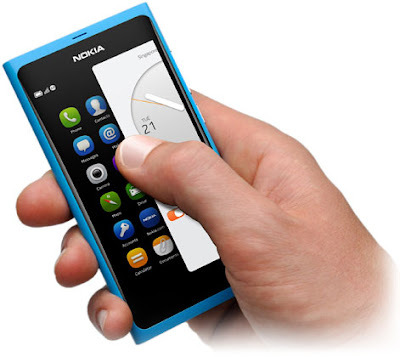 The N9 is an absolutely stunning device - sleek, minimal, with a curved glass front and no visible buttons. What was more shocking, however, was the software. Nokia's MeeGo 'Harmattan', powering the new flagship, was not only good, it was as stunning as the hardware. This is Nokia's iPhone; the attention to detail and design ethos is really befitting a modern smartphone platform. The OS feels alive, with UI elements swooping gracefully under your finger, alerts and dialogues popping onscreen with a bounce. The software and hardware feels like it was designed from the ground up together as a seamless whole. Multitasking is performed by swiping a finger from any side across the curved glass screen; notifications from all your services (Facebook, Twitter, mail, etc) have a dedicated section on your homescreen. The design language and iconography is a breath of fresh air. Performance-wise the device screams, as everything is running as native code and the GPU controls everything onscreen (a la Core Animation on iOS). 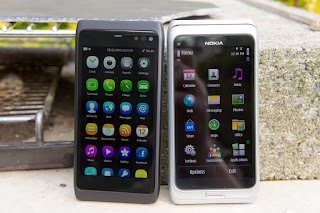 The N950, running MeeGo Harmattan, beside the E7, running Symbian. OCD bonus: you can order your icons by color to really make your device stand out. MeeGo Harmattan is a full GNU/Linux stack, and seems to hold its developer roots close to it; right in the Settings app is a toggle switch to turn on 'Developer Mode', effectively giving you root access and an SSH shell. 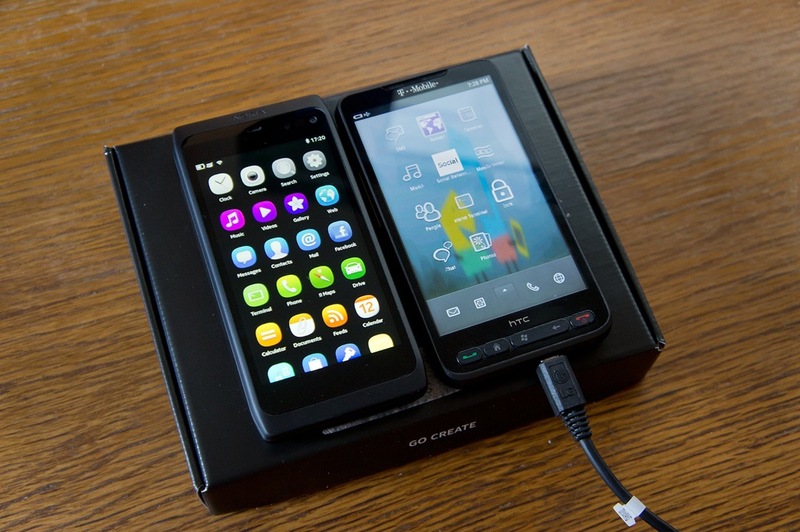 The N900 (the precursor to the MeeGo initiative) was renowed for its hackability in much the same way. It's very likely that the N9 will be able to dual-boot Android like the N900 before it, so I have a feeling that this device will be extremely popular in the techie community. MeeGo Harmattan puts Android to shame, design-wise, whilst retaining the über-hackability that developers and geeks adore. Having used the developer version of the N9 hardware, the N950, for a few weeks now, I can safely say that MeeGo Harmattan is right up there beside iOS in the user experience department. Everything is consistently good, even the third party apps. This design really has been thought through even to the smallest details. The development frameworks allow you to create really great apps, consistent with the rest of the OS (even inheriting the subleties of animation and timing and interaction, similar to iOS). Even on last year's hardware everything is smooth and pleasant to use. MeeGo Harmattan, unlike so many other OSes, is not shallow; the user experience goes all the way to the core. It has soul. It absolutely deserves to stay on the market in some form, even if WP7 becomes Nokia's primary smartphone platform. The N9 is a glimpse of what could have been; it doesn't sound like Nokia has any plans to continue making MeeGo smartphones. I fully agree that they should be laser-focused on Windows Phone, but it makes me sad to think that such an awesome device and OS have no future (beyond being the poster child for Qt mobile development as Qt expands to Nokia's dumbphone platforms). The N9 and MeeGo were too risky a bet for Nokia's future smartphone platform; CEO Stephen Elop describes the WP7 move as 'removing the handcuffs' for the MeeGo team - the fate of Nokia was no longer on their shoulders, so they could pull out all the stops to make an amazing OS to truly show that Nokia's still got it. What becomes of that OS now, we don't know. Nokia calls it their plan for 'future disruptions', which could very well mean using it for a tablet (Elop stated that Nokia very much has to be in the tablet space at an AllThingsD conference recently), or keeping it on the backburner as a 'just in case' scenario. Does the general populace need another smartphone platform? No, I don't think so. But I absolutely think that we, the tech fringe, are better-off with this one in it. The N950 license agreement, as it's prerelease hardware, specifically states that I cannot say anything negative about it. Fortunately, I honestly don't have to take that into account as I have absolutely nothing negative to say. It's that good.